When you want to have a bar in your home, but want to keep it a bit more discreet, then check out this cool new Noble Drink Server. 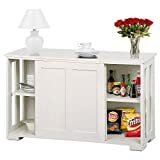 While it may look like a luxurious buffet table, it has a sliding top that reveals a removable stainless steel drink basin that is large enough to hold ice and multiple bottles of wine and a bar below hidden behind large hinged doors. 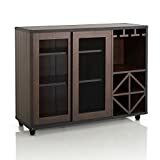 Crafted from solid wood with a rich mahogany finish, this unique piece also features adjustable shelves, wine glass racks, and three storage drawers for all your various barware, booze, and other entertaining essentials.